"The book will be one of the queerest in the world, but it is full of genius and poetic beauty and will find its place." 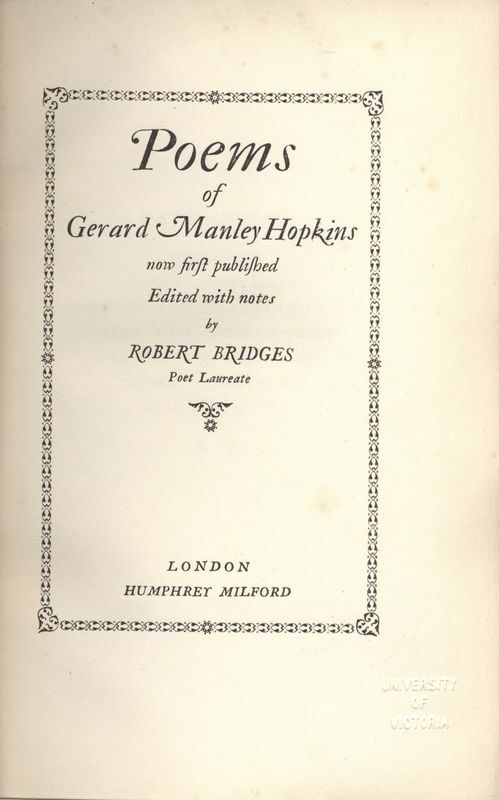 In 1918, Poet Laureate Robert Bridges published the first edition of the poems of Gerard Manley Hopkins, twenty years after Hopkins’s death in 1889. Consistently rejected by his Victorian contemporaries, Hopkins was enthusiastically embraced by modernist poets who found Hopkins’s poetics divergences resonant with their own modernist values. 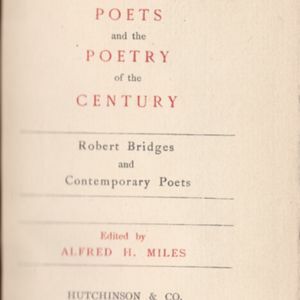 Although Bridges’s edition initially gathered a small, enthusiastic audience of critics and poets, Hopkins's poetry would not reach widespread popularity until its second reprint in 1930, edited by Charles Williams. Hopkins’s works have been consistently republished in critical editions, literary anthologies, and translated into many languages, as readers continue to be fascinated with the Jesuit poet and priest whose poetry seems to anticipate a literary movement ahead of his time. Bridges and Hopkins were close friends from their undergraduate years at Oxford. Despite their diverging paths after graduation—Hopkins to the Jesuit order, Bridges to medical school—both men remained close correspondents until Hopkins's death. Hopkins and Bridges made an unusual pair, their lively and heated correspondence was dominated by their differing opinions on art, religion, and politics. These differences seemed to fuel a friendly rivalry between them, as both freely exchanged their poetry, criticisms, and encouragement of the other’s works. While Bridges’s popularity grew, however, Hopkins remained unpublished in his lifetime, read only among his few, select friends. After Hopkins's death, Bridges became the literary executor of Hopkins’s work, relying as source material many of the works Hopkins shared with him in their letters (Bridges “Preface to Notes” 94). Several factors contributed to the twenty-year delayed publication of Hopkins’s poetry. Editors of Hopkins works have consistently remarked on the errors and inconsistencies in punctuation and grammar among the surviving manuscripts, many owing to Hopkins's lack of revision (MacKenzie 10, 16; Sulloway xiv; Phillips xli). 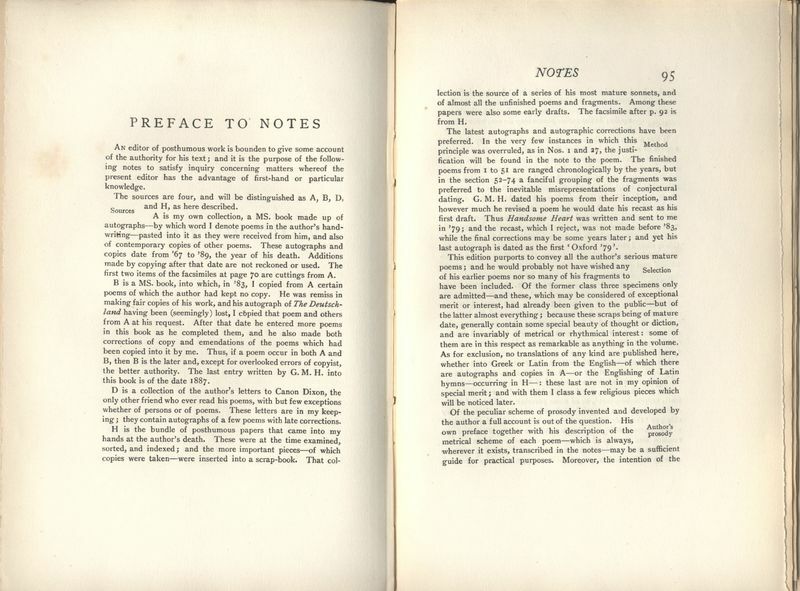 Bridges notes in the preface to his notes that Hopkins was “remiss of making fair copies of his own work” (94), often allowing Bridges to transcribe his poetry for him. After his death, therefore, Hopkins left an enormous task to his editors to collate, compare, and edit his remaining poetry, often left in a state of illegible, heavily annotated and revised fragments. Beyond this lengthy and laborious editorial process, Paul Mariani suggests that rivalry may have also induced Bridges to postpone publication, as Bridges was keen to have his “own method of prosody recognised separately from Gerard’s” (Bridges qtd. in Mariani 428). 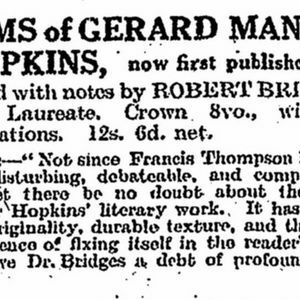 Most agree, however, that Bridges was cautious about publishing Hopkins at a time which he would receive the least criticism (Mellown "Public" 99; Mariani 428). While he published a few of Hopkins’s devotional poetry in Catholic publications, included a few pieces in an anthology of contemporary poetry, and shared other sonnets among some literary circles, he withheld Hopkins’s more ambitious pieces for a time that would best appreciate his experiments. The post-war modernist movement, dissatisfied with older conventions and seeking more experimental modes of art, seemed the ideal audience to receive Hopkins's poetry. Claude Colleer Abbott applauds Bridges for this caution, calling Bridges’s edition a “masterpiece of editing” (xvii) and suggesting that “no poet has ever been treated by a contemporary with greater reverence” (xvii). Despite this “masterpiece” of editing and careful curation, however, the 750 copies of the first edition, selling for the pricey sum of twelve shillings and sixpence (Mellown "Reception" 39), would not sell out completely for another ten years (39). The Special Collections at the University of Victoria holds one of these rare copies. This exhibit will discuss the distinguishing modernist features of Bridges's first edition and will analyse the extent that his editorial revisions of Hopkins's manuscripts reflect his own poetic biases and a singular version of Hopkins that is primed towards a modernist audience. It will also consider the Hopkins's and Bridges's differing views of authorship and the collaborative dimensions of editing and publishing poetry. Bridges’s edition carefully crafts his first edition to appeal to a limited, modernist audience. He presents Hopkins as an obscure, poetic genius and misunderstood Victorian visionary, with some literary merit and distinguishing peculiarities that the occasional "metrist" or "rhythmist" (“Notes” 106) could find interesting. The Poems of Gerard Manley Hopkins, moreover, is as much a celebration of Hopkins's works as a testament to Bridges’s own editorial feats; his decision to include facsimiles, signatures, a eulogy and Latin dedication, personal letters, and an extended preface to the notes all serve to defend his editorial licenses and special authority as Hopkins’s close friend, earliest critic, and most qualified curator of his works. At the same time, his edition reflects his own poetic biases and specific interpretation of Hopkins that, as some critics have noted, shaped, and perhaps even deterred, Hopkins’s early reception. In a letter to the poet A.E. Housman, Bridges shares that the book of poetry he was working to publish “will be one of the queerest in the world, but it is full of genius and poetic beauty and will find its place” (Selected Letters 735). Finding a “place” for Hopkins poetry has been, since Bridges’s own first edition, a thematic challenge for critics and audiences who struggle to reconcile Hopkins's Victorian and modernist characteristics. Tracing the history of Hopkins’s reception, Elgin W. Mellown notes that some early reviewers, uneasy about their enthusiasm for a Victorian poet, claimed Hopkins for themselves as a modernist ahead of his time ("Reception" 45). As Mellown argues, at the time of its publication, “there was more interest in ‘new’ poetry,” particularly rendered by the war, which “had destroyed many conventions and old barriers” ("Public" 99). Others have also noted that Hopkins was deeply appealing to the modernists, as the scope of his iconoclastic, poetic experiments could not have been fully appreciated until their post-war reception (Mariani 428). Indeed, Bridges was scrupulous about waiting for a period when Hopkins’s poetry would be met with the least criticism, choosing to publish Hopkins’s poems individually in the occasional periodical before releasing a full volume (Mellown "Public" 99). Bernard Bergonizi believes that Hopkins simply lived at the wrong time, suggesting that if Hopkins had published at an earlier time of the nineteenth century, he would perhaps have been far more successful and even influential in reshaping the nineteenth-century canon (86). At the same time, Alison Sulloway defends Hopkins’s essentially “Victorian temper,” and persuasively situates him within his Victorian artistic context. Hopkins’s mentors at Oxford include John Ruskin, Walter Pater, and John Henry Newman, all three of whom were deeply influential and formative to developing Hopkins’s aesthetic, theological, and philosophical vision (Sulloway 1). In his role as a Jesuit priest, Hopkins was also deeply involved with social issues of poverty and literacy of his time, and his poetry also criticises the harmful environmental impact of the Industrial Revolution. Hopkins himself rejected the idea that his works were too obscure to be appreciated or understood, and defended that his unusual poetic and metric innovations were actually keeping true to a pre-existing English literary tradition (Letters 30 May 1878). And Hopkins was not without a few contemporary admirers: his friends Richard Watson Dixon and Coventry Patmore, both established poets at the time, recognised Hopkins’s genius and urged him to publish, much to Hopkins's continued resistance (Gardner 1). As it is, while his poetry had little impact in his own Victorian culture, his publication in the early twentieth century was pivotal in shaping modernism and poets such as Dylan Thomas, W.H. Auden, and Seamus Heaney. Hopkins is thus a poet of two eras, writing to and within a Victorian context but whose legacy is not fully realised until the twentieth century. Bridges’s own edition seems to recognise this difficulty of placing Hopkins, and perhaps even contributed to Hopkins’s ambivalent, dual identity. 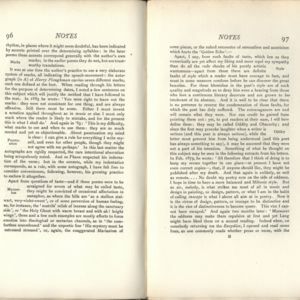 The alleged "queerness" of Bridges's first edition combines features of both literary eras, presenting Hopkins as something of a novelty poet and eccentric Victorian who, despite certain faults of taste and disregard for literary conventions, could be appealing to a niche, modernist audience. For this reason, Bridges did not seem to publish his first edition with a broader public in mind. 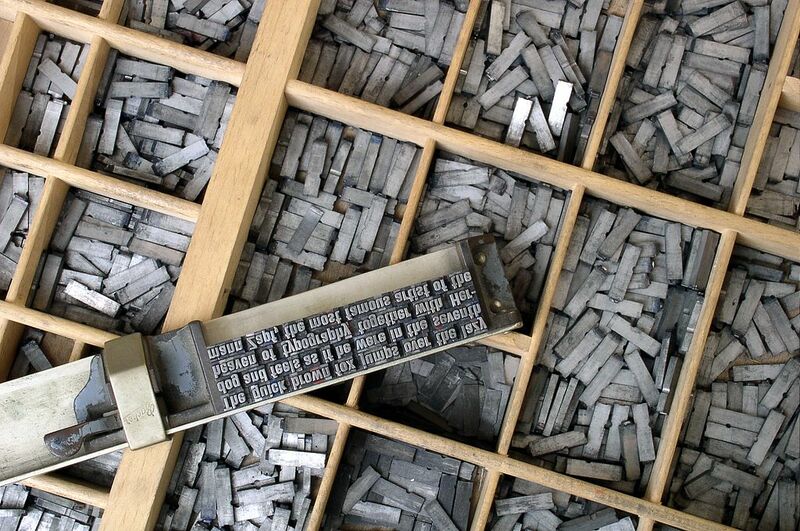 According to Mellown, the paper “was of the best quality,” and “only 750 copies were printed, priced at twelve shillings and sixpence, “roughly two or three times the average cost of a book of poetry in the years 1916-20” ("Reception" 39). Bridges’s inclusion of facsimiles of manuscripts, fragments and unfinished works (figs. 5.1-2), signatures (figs. 5.3-4), and high-quality etchings (figs. 1.1, 4.5), further suggest the edition as both a personal devotion to a close friend, as well as a carefully curated presentation of Hopkins as a forgotten Victorian, now reclaimed by the modernists. 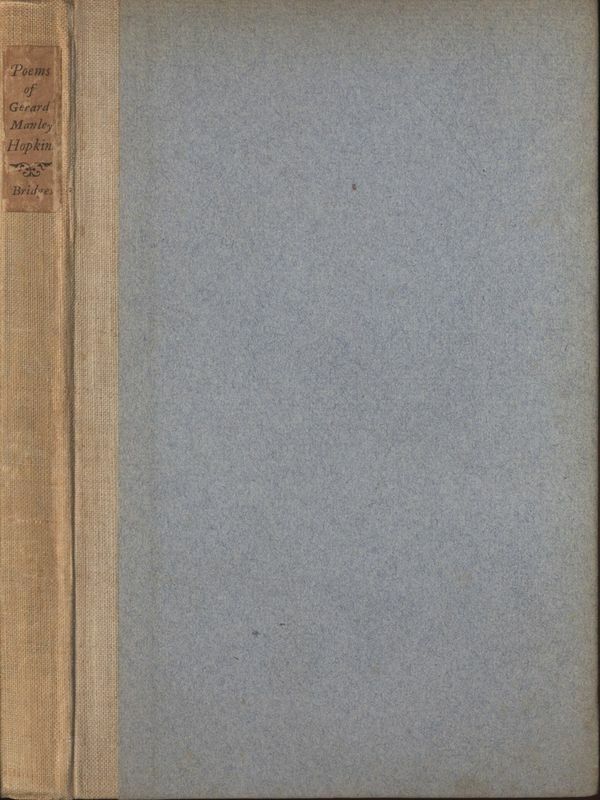 The slim, minimalist blue cover (fig. 2.1) lacks all the gildings and decorations of a Victorian book of poetry. 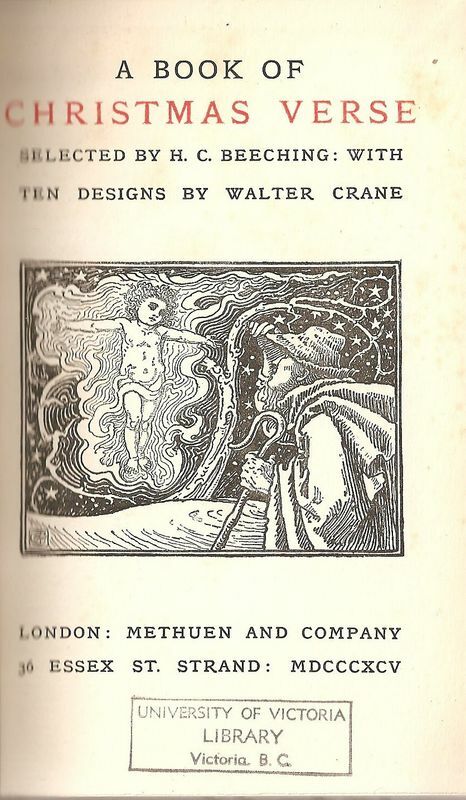 The inside title page's decorative border and long “s” (fig. 2.2), however, gives the book a slightly antiquated quality. Bridges's edition gains a distinction by subtly incorporating qualities of both eras. In addition to these distinguishing features, Bridges's includes his name and credentials as Poet Laureate within the title, likely to promote sales and establish his authority as curator of a forgotten poet. Thus, the expensive, limited distribution, the combination of Victorian and modernist design, and the personal and biographical elements of the edition ultimately reinforce Bridges’s belief that Hopkins’s eccentricities would find more success among select, literary audiences. Bridges explains that he wanted the translation to be in Latin to "keep it clear from the rest of the book," because an English dedication would “disturb the first pages” (Selected Letters 735). Besides giving the edition a distinctiveness, the dedication also adds a personal dimension. Resembling the form of a diamond, the dedication echoes Hopkins’s motif of the soul as an “immortal diamond” (“That Nature is a Heraclitean Fire and of the comfort of the Resurrection”), a reminder of the poet's own intrinsic value. Nearly fifty years later, in 1975, the phrase “immortal diamond” would appear on Hopkins’s tombstone in Westminster Abbey. Yet love of Christ will win man’s love at last. Thy plumage of far wander and heavenward flight! To Bridges, Hopkins's Jesuit order preyed on both his physical weakness and spiritual sensitivity, ultimately inhibiting the cultivation of his poetic gift. Throughout his notes in the edition, Bridges frequently associates Hopkins's eccentricities and idiosyncracies to this sensitivity that was susceptible to, and perverted by, the austere conditions of Hopkins's environment. Fig. 3.1 First page of "The Wreck of the Deutschland"
"This editor advises the reader to circumvent him and attack him later in the rear; for he was himself shamefully worsted in a brave frontal assault, the more easily perhaps because both subject and treatment were distasteful to him." - Bridges, on "The Wreck of the Deutschland"
These experiments, Bridges owns, “could never be popular” but “they will interest poets; and they may perhaps prove welcome to the critic” because they “show a neglect of those canons of taste which seem common to all poetry” (164). Bridges would repeat this conservative praise and apologetic tone years later in his 1918 preface. In his preface to the volume of poetry, Bridges comments on the peculiarities of Hopkins’s poetry under headings of “obscurity,” “punctuation,” “mannerism,” (figs. 4.4-6) and other faults that seem to limit Hopkins’s readability. Once again, Bridges apologizes for Hopkins’s “fault of taste,” and distances himself from the poet’s “occasional affectation,” his "repellent rhymes," his "vice of distintiveness," his “efforts to force emotion into theological or sectarian channels,” his “exaggerated Marianism,” and all the “rude shocks of his purely artistic wantonness” (96-97). Bridges suggests that good poetry rarely asks for the kind of “conscious effort of interpretation” that Hopkins’s poetry demands of readers (98). For instance, Hopkins often omitted a relative pronoun in his poems, which Bridges believes is simply a matter of Hopkins’s economy and desire to “crowd out every merely grammatical colourless or toneless element” with “his poetical worlds” (98). “Squander the hell-rook ranks sally to molest him” means “Scatter the ranks that sally to molest him” (98). The omission of the relative pronoun “that” results in the crowding of many “poetical words” and, ultimately, an ambiguity of meaning. An “essential propriety” of poetry, Bridges claims, is to be grammatically coherent and unambiguous (99). Ultimately, Bridges may excuse these oddities and neglect of style, because he does believe in Hopkins’s genius, unpolished as it may be. 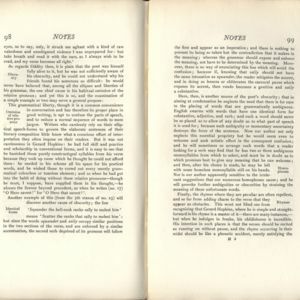 As Mellown concludes of Bridges’s notes, "Bridges quite clearly showed his opinion that Hopkins' poetry was to be valued for the occasional beauty of the novel technique and for its unfulfilled promise" ("Reception" 38). "The Wreck of the Deutschland"
“The Wreck,” Bridges establishes, is a “great metrical experiment” that will interest only the “metrist and rhythmist” and will likely deter other readers. 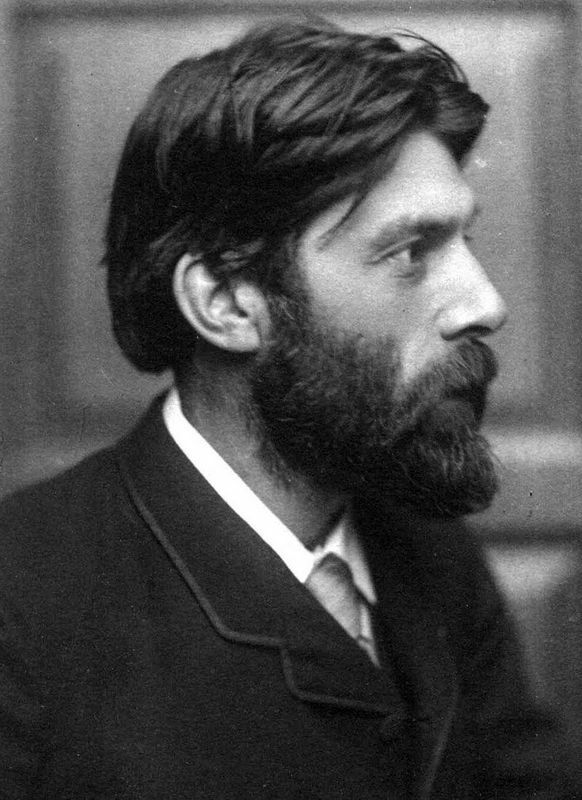 Bridges's complicated relationship with the poem dates back to his first reading in 1877, where, in a letter to Hopkins, he had vowed to never read it again "for any money," and even included in a parody in his reply. Hopkins conceded that the poem perhaps should have had "more wreck and less discourse," and wryly notes that Bridges's parody demonstrates at least "understanding of metre," if nothing else (Letters 46). The poem emerged after a nearly nine year period in which Hopkins refused to write any poetry in order to devote himsef to his Jesuit duties. The incident of the shipwreck of the Deutschland, however, moved him so much that his abbot suggested Hopkins write a eulogy for the Jesuit periodical, Month. As Mariani writes, Hopkins threw himself into the task, pouring into it nine years of his theological and artistic developments. 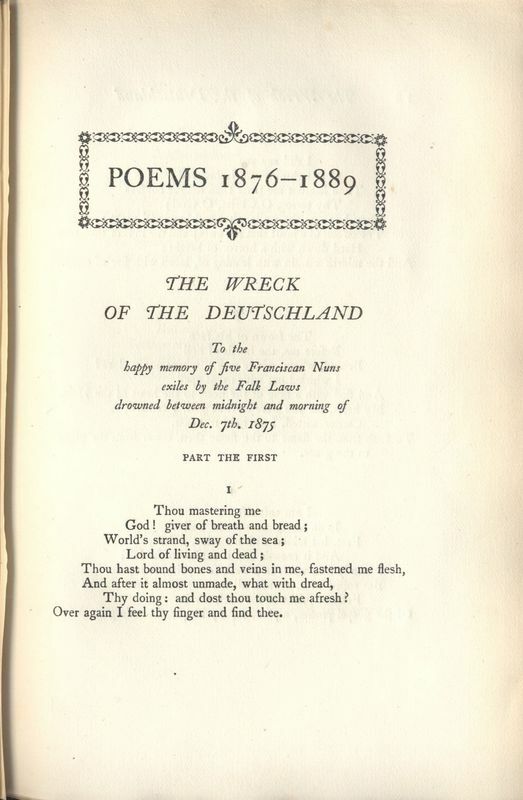 Although the Month rejected the ambitious epic, the "Wreck of the Deutschland" is a pivotal moment in Hopkins's career, marking a "sudden, unexplained, hundredfold resurrection of his precious, long-slienced poetic gift" (155). Bridges, however, found Hopkins's bold, experimental style too obscure and overbearing, a criticism which would repeat thorughout their correspondences. W.H. Gardner argues that, by the time of the 1918 publication, Bridges was still "by temperament and predilection" unfitted for the task of editing "The Wreck of the Deutschland." Moreover, Gardner argues that Bridges's lack of "thouroghness, understanding, and discretion" in his critical introduction to the poem proved almost fatal to the poem's reception and "prevented almost a generation of readers from approaching it in the right spirit of confidence and understanding" (208). Today, "The Wreck" is considered to be one of Hopkins's masterpieces. This gallery features the entirety of Bridges's "Preface to the Notes" (figs. 4.1-4) as well as other defining features of the first edition, including an etching of a younger Hopkins (fig. 4.5), the Table of Contents (fig. 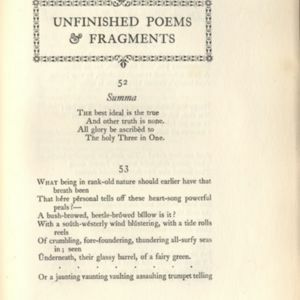 4.6), and the inclusion of Unfinished Poems & Fragments (fig. 4.7). "I do not write for the public. You are my public and I hope to convert you." Hopkins's understanding of his own authorship, then, had a complex relationship with his religious duties, which seemed to both hinder and enable his poetic production. The sonnet begins in traditional, iambic pentameter, but switches in the second line to something resembling a dactyl. The second line, although considerably longer, still contains only five stressed syllables and matches the upward ascent of a bird. Each line contains five stressed syllables, in varying metrical pattern. 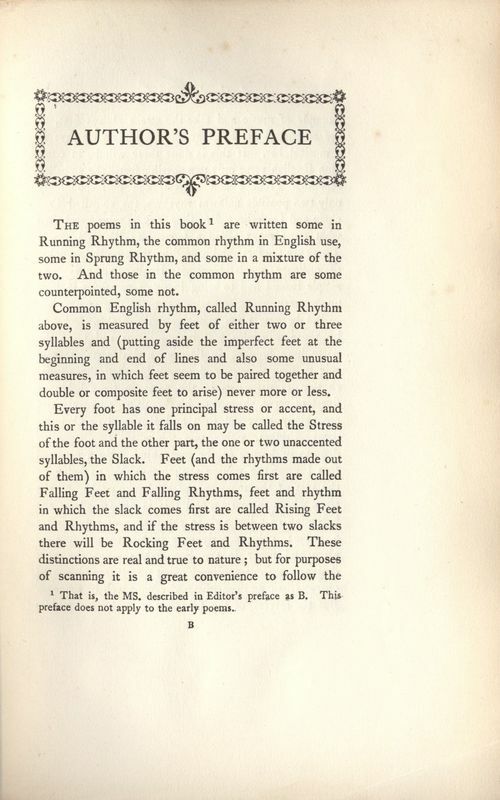 A cluster of unstressed For Hopkins, his poems with sprung rhythm were “less to be read than heard” (Letters 46). Hearing the varying patterns of rhythms in a poem could evoke certain responses. This metric innovation ultimately grants Hopkins a great flexibility that, much to Bridges’s own disapproval, allows Hopkins to disregard poetic or grammatical conventions. Gardner suggests that poetic rhythm for Hopkins were “fluid architecture” (13) and architecture was “frozen music” (13). Hopkins ultimately sought to reveal through his flexible poetics this “frozen music” inscribed in the world. Poetry, then, is the process of encountering and engaging with this "frozen music" and varying inscapes in the world, and Hopkins required a poetics that could mediate these encounters. To Bridges, Hopkins’s Jesuit vocation was an unfortunate circumstance and barrier to his genius. He considers Hopkins’s more explicitly religious and devotional verses as lacking “class,” suggesting that, in Hopkins’s earlier devotional poetry, his “views of poetic form had been provisionally deranged or suspended, [so that] the verses can hardly be attributed to him without some impeachment of his sincerity” (105) Bridges was solely in Hopkins’s poems of “genuinely poetic interest” (105) and of “serious artistic work” (105). Beyond the exclusion of Hopkins’s more overtly devotional poems from the first edition, Bridges also removed Hopkins’s original markings of metre nad prosody and takes the liberty of changing words or inserting relative pronouns for the sake of accessibility. This "fluid architecture" underlying Hopkins's poetics ultimately rendered his poetic process as an ongoing project. 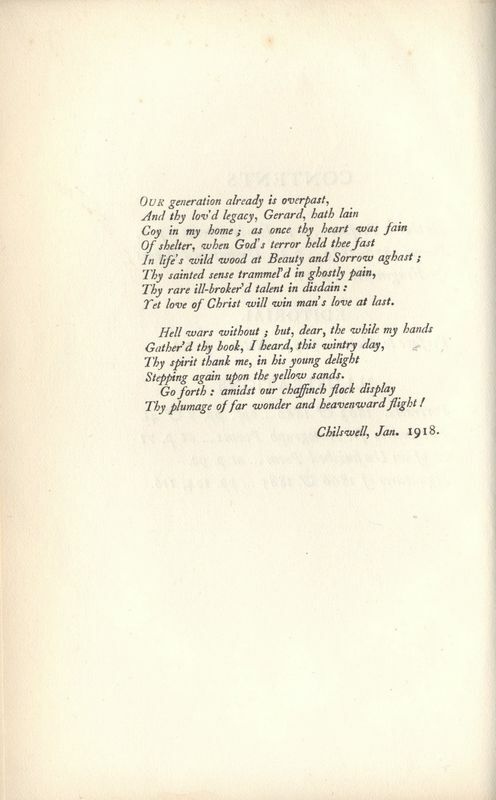 Hopkins’s poems were rarely finished, or often illegible with his continual revisions. Hopkins did not create any fair copies of his own poems, and his own manuscript drafts often defy straightforward interpretation. For this reason, Norman H. MacKenzie questions the possibility of a definitive text. He cites Hopkins's "Jesuit detachment" as reason for the poet's lack of dedication to revision or careful attention to details. Hopkins, MacKenzie writes, was a sloppy writer, leaving to his subsequent editors "hard decisions on minutiae that his poetic genius soared above” (4). Bridges is also transparent about the editorial hurdles to transcribing and publishing Hopkins's poetry. He claims special authority, however, as Hopkins's close friend and correspondent, as the competent editor and interpreter of his poems. He includes personal letters in his notes that refer to conversations surrounding the poems Hopkins would share with him, suggesting that Hopkins would have "no doubt" approved of Bridges's changes (121). 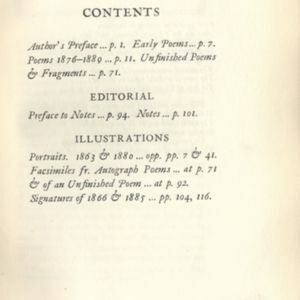 Bridges further includes two facsimiles of Hopkins's poetry in his first edition to demonstrate the difficulties of interpreting the poet's handwriting. Bridges’s edition ultimately raises questions about the authorship, particularly in posthumous publications when authors have no participation in their own revisions and publications. Who, then, is most qualified to curate Hopkins’s work? Can any editor match Hopkins’s original intent? If not, then do the poems we read really belong to Hopkins, or must authorship have a larger definition to include editors as well? Hopkins himself admitted to Bridges that his sonnets came to him "unbidden and against [his] will" (Letters 221), seemingly reinforcing Bridges's own attempt to distinguish the Hopkins's careless eccentricities from the "rare masterly beauties that distinguish his work" (10). If, as Bridges suggests, Hopkins lacked self-control in his poetic impulses, then he required the guiding hand of an editor or literary critic, such as Bridges, to help him achieve his fullest potential. Hopkins’s official introduction to the world, then, is carefully curated by the professional, creative collaboration that Hopkins lacked during his own lifetime. 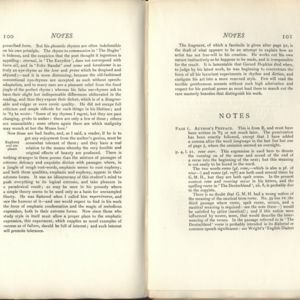 Subsequent editions have challenged and revised Bridges's commentary of Hopkins, choosing to return to Hopkins's original manuscripts and include his original markings and words. Charles Williams’s 1930 edition, for instance, is far more receptive to Hopkins’s style. Charles Williams applauds Hopkins’s alliterative genius, his pace, his incomprehensibility that seems to intensify with every reading. He predicts that poets “will return to him as to a source not a channel of poetry; he is one who revivifies, not merely delights, equivalent genius” (175). Williams, moreover, identifies that beneath “all the art of the impulse and rush” (173) of Hopkins poetry is a “careful labour” and attention to style that deserves the continued reading and attention it demands. Ultimately, editors who have disregarded Bridges's revisions for the original manuscripts still face the same challenges and questions of deciphering Hopkins's manuscripts. How much of Hopkins’s unrevised or unfinished manuscripts can editors attribute to Hopkins’s original intent, and how much is the product of a a hurried, "artistic impulse"? If each edition is an interpretation of Hopkins and an attempt to make Hopkins's manuscripts "readable" to the public, can editors be considered creative collaborators of Hopkins’s poetry? And if the reading, and re-reading, of Hopkins is an attempt to make sense of his obscure and inscrutable style, do readers unwittingly become his creative collaborators as well? University of Victoria's McPherson Library and Special Collections holds several copies of the earliest anthologized appearances of Hopkins's poetry prior to the 1918 first edition, including: H.C. Beeching's A Book of Christmas Verse (1895) which includes "The Blessed Virgin Mary, Compared to the air we breathe"; Alfred Miles's The Poets and the Poetry of the Century (1906), which includes multiple poems; and Nicholson and Lee's The Oxford Book of English Mystical Verse (1917), which includes "God's Grandeur." The McPherson Library and Special Collections at UVic also holds several periodicals and newspapers associated with the first-edition publication and second edition reprint of Hopkins's poetry, most notably a reproduction of the Times Literary Supplement, which contains several advertisements leading up to the first-edition publication, as well as critical reviews and articles that helped circulate Hopkins's poetry to wider audiences. Other periodicals in the library holdings which have published Hopkins include Once a Week, Periodical, Union Review, and Month, the latter of which infamously rejected Hopkins's "The Wreck of the Deutschland." That "unwise blunder," the Month admitted in the 1975 centenary celebration of "The Wreck," has "gained for the Month more notoriety than all the distinguished articles it has wisely published" (qtd. in Mariani 433). Lippincott’s publication of The Picture of Dorian Gray heavily revised and censored Oscar Wilde’s controversial novel, even publishing the book with subliminal Pears Soap advertisements that offer to "cleanse" the reader from immoral contamination. Only recently has Oscar Wilde’s initial manuscript for the Lippincott edition been published in its entirety. Stephen Crane's The Red Badge of Courage, like Hopkins's poetry, also arguably lacks a definitive text, as Crane left behind several revised versions of his novel. Subsequent editions of the novel have disputed the "authoritative" version. Sylvia Plath’s The Bell Jar suffered unauthorised revisions by her American publishers after Plath's death and despite her insistence that her novel would not be published in America. Like Hopkins, Plath’s own life has become inseparable from the interpretation of her work, echoing Bridges’s important question of how much of an author’s life and work is really his or her own. Abbott, Claude Colleer, editor. The Letters of Gerard Manley Hopkins to Robert Bridges. Oxford UP, 1935. Bergonzi, Bernard. Gerard Manley Hopkins. Collier Books, 1977. Bridges, Robert, editor. The Complete Poems of Gerard Manley Hopkins. Humphrey Milford, 1918. Gardner, W.H, editor. Poems and Prose: Gerard Manley Hopkins. MacKenzie, N.H, editor. The Later Poetic Manuscripts of Gerard Manley Hopkins. Garland Pub, 1991. Mariani, Paul. Gerard Manley Hopkins: A Life. Viking, 2008. Mellown, Elgin W. “Gerard Manley Hopkins and his Public, 1889-1919.” Modern Philology. 57.2 (1959): 94-99. ---. "The Reception of Gerard Manley Hopkins' 'Poems', 1918-30." Modern Philology 63.1 (1965): 38-51. 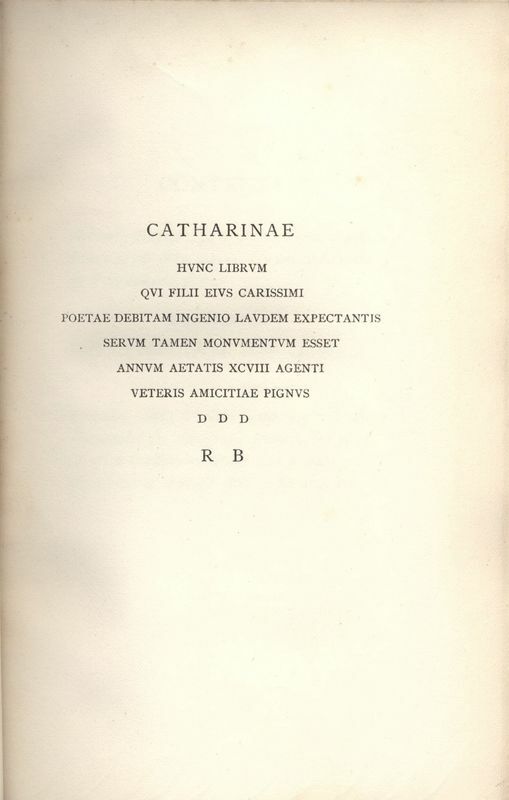 Phillips, Catherine, editor. Gerard Manley Hopkins: The Major Works. Oxford UP, 2002. Storey, Graham. A Preface to Hopkins. 1981. Routledge, 2014. Sulloway, Alison. Gerard Manley Hopkins and the Victorian Temper. Routledge, 1972. Tackett, Justin. “From the Margin to the Core: the Vagaries of Publicizing Poems of Gerard Manley Hopkins in 1918 and 1930." Hopkins Quarterly 42. 1-2 (2015): 1-22. White, Norman. Hopkins: A Literary Biography. Oxford UP, 1992. Print. Willimas, Charles. "Introduction to Poems of Gerard Manley Hopkins." 1930. Gerard Manley Hopkins: The Critical Heritage. Edited by Gerald Roberts. Routledge, 1987: 171-175.